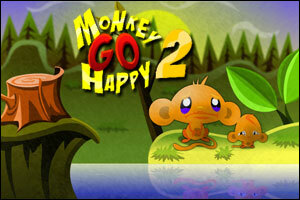 Monkey GO Happy 2 is the second installment in the Monkey GO Happy series created by Robin Vencel, the author of the Popular Bowja the Ninja series. If you enjoyed the original, you will love the sequel! Monkey GO Happy 2 video walkthrough! doh. Can’t read the clue for the last stage. …and it is stage 15, not the final one. Two of my favorite Mini-game game makers are Ninjadoodle (Creator of ClickPLAY, NerveJangla, etc.) and Robin Vincel (Creator of this game)! Interesting note: Ninjadoodle is Tom Vencel and Pencilkids is Robin Vencel. They make similar style games. Any shot they’re related? Also, official video walkthrough: Monkey GO Happy in 104 clicks. 102 is the minimum possible, by my count. Tom and Robin are brothers, so yeah, they are related! Okay, I must be a dope today. I’ve cleared every level but the one with the 30 marbles in the cave. I can’t find that darn 30th marble and I’ve retried it several times. Anyone have a hint for a tricky, well hidden marble? NVM, I found a walkthrough with each marble on it and for some reason, my game doesn’t show the very left edge of the screen, which is where one marble is hiding. Oh well, guess I won’t ever get to finish. And TEXT WALKTHROUGH coming soon! WOW! Thanks Robin and Prid! It’s so nice of you to help me. Nothing worse than not being able to get the very last little bit of a game. I’ll go finish it up now. Spring tulips to you both!! Click on the Pieces of Woods on each side of the Hot Air Balloon. The ones that are tied to a Rope from the Air Balloon! Click on all the 4 Sandbags to remove them, and finally click on the Burner* inside the Air Balloon, to make it fly! Click on the Stick that is sticking out form the Snow, on Right-side of the Snowman. You’ll notice which Stick I am talking about if you click on the Sledge before removing the stick! Once the Stick is rotated, click on the Sledge on Top of the Hill to make it crush the Snowman! Take Cloth, near Bottom-Right of screen, it is on the ground next to the Stick! Dip Cloth in Oil on the ground, which is at bottom-right side of the Big Monkey! Use Cloth on top of the Stick [Bottom-Right], and take the Rocks on Bottom-Left side of screen. Use Stones on the Oiled Cloth on top of stick! LEVEL 1: Just shoot all the enemies by moving Left and Right, while shooting! LEVEL 2: The enemies will be shooting from Left to Right, starting with the Ship on the most Left-side. At the beginning of Level 2, start by shooting the Middle-Top enemy, and continue to shoot the to other on Right-side of it. Then, quickly move to the Enemy next to the enemy on most Left-side, and shoot it! Wait for the remaining enemy to shoot, and once the Bullet is gone from the screen, quickly move below the enemy, and shoot it – or you could be very fast and shoot the last enemy before it destroys you! LEVEL 3: Quickly Move RIGHT, before the Middle enemy hits you with its bullet. Once moved Right, shoot the 2 Enemies on Right-side, and then shoot the Middle enemy. Shoot the enemy on right-side of the enemy on most Left-side, and wait only 1 Second (that is because the last enemy’s recently shot bullet may hit you if you hurry). Then, quickly kill the last enemy! Example: if it says 3×4, you have to count 3 From Top-Left of Grid, and then count 4 Downwards. Always remember that the point you start at is counted as 1, so if it says, 2×4, move only once Downwards from Top-Left, and only 3 Times from Left to Right, from that point! Tips: Try using your Finger, by pointing with it. Start at Top-Left, and count the first number from Up to Down while moving your Finger as well. And then just count from the point you stopped, Left to Right as many times as the 2nd Number tells you to. Then, just click on that Square, but remember that the point you start on is counted as 1, and if you start counting on the 2nd Number, the point you are at, is counted as 1! Just count from Top-Left like I tell you to, but remember that the starting point is counted as 1, and if you change direction from Down to Right, the point you stopped on when counting Downwards, is also counted as 1! Click on the Black Pin, that the Middle-Top Picture is hanging on, to remove it. Click on the Code Panel behind it, and type: 2 9 6 4 – once safe opens, click on the Yellow Ball! Click on the Long Part of the Cut Tree on Left-side. Click to take the Left-side Big Leaf on Right-side of screen! Take the Tree Stick [Top-Left of Big Monkey’s Head]! Put Stick on Middle of Tree-part on water, and then attach the Leaf to the Stick – finally, click on the “Boat”! Look at the Grey Clouds on the Sky. Click on the one farthest from you, and then keep clicking on the Clouds from Farthest to Nearest, after one vanishes! Click on the Grass Straws/Small Bush between the 2 Cactuses, and take the Stone/Rock. Use Stone/Rock on the Chest Lock, click on its Top-Part to open, and click inside to view. Take Metal Detector and Spade! Use Metal Detector on the sand, near Top-Left part of the Chest, until a X is found. Don’t disarm the Metal Detector, but move it around the Middle-Right side of the screen, until another X appears (simply move the Metal Detector up and down on the Left-side and Right-side of screen)! Use Spade on both of the X-es. Take Key from Left-side hole, and use it on the Treasure Chest on Right-side Hole! Click on the 2 Planks on Bottom-Left side of screen, to move them. Click on the Yellow Trash Can, and take the Pin that fell out of it (it will shine once it falls)! Use Pin on both of the Truck Wheels, put away the Pin, and click on the Truck! Click on the Top-Right side of the Poster, to remove it (click on it a few more times). Note 0800 and CLOWN! Open Last/Bottom Drawer, take Cord, open the Drawer above the Last/Bottom one, and take Key! Once done, use Key to unlock Door, and click on Door Handle to open! Take Crowbar on Bottom-Right side of screen, and use it on the Power Door Lock. Click on Door to open it, and click on the Top Button, 1 Time, Middle Bottom, 2 Times, and Bottom Button, 3 Times! Let Top Button face Right-side, Middle Button Down, and Bottom Button left-Side – click Level to open another Door! Click on the Puzzle Pieces to make an Understanding Image of a Monkey in a Buisness Suit! This will show you where all the Eggs are, and NOTE that you can click anywhere in this Level without getting a Click added to your score! This will decrease your Final Score, but if you fail to collect all the Eggs before the time Runs out, you won’t lose – only get a bad score! I finished in 101 but see low score is 95. What does the answer code mean when you finish the game? It says monkey002? Please tell me What Does Monkey002 mean? Posted on Wednesday, April 7th, 2010. Follow any responses through the RSS 2.0 feed.